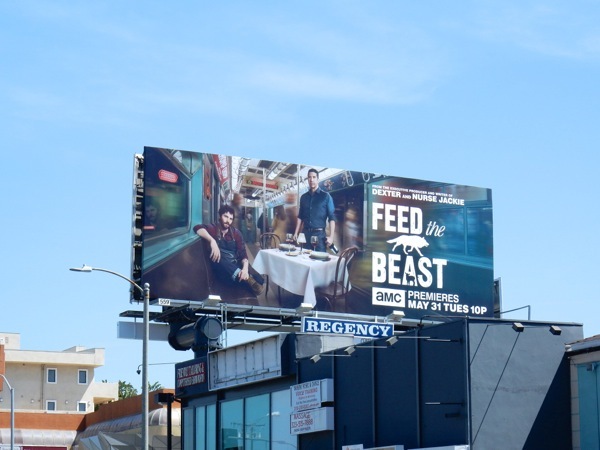 Most people know David Schwimmer as 'Ross Geller' from the generation-defining sitcom Friends (or as the voice of 'Melman' the giraffe in the Madagascar animated movies), but now he's back on the small screen with Jim Sturgess in the dark comic drama, Feed the Beast. 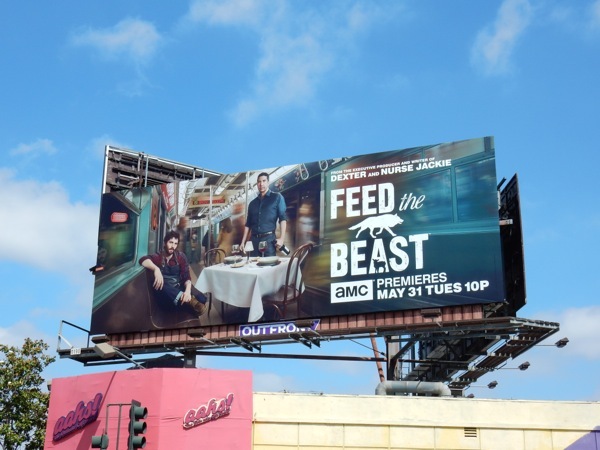 The pair play old friends with issues who open a fancy restaurant in the Bronx. 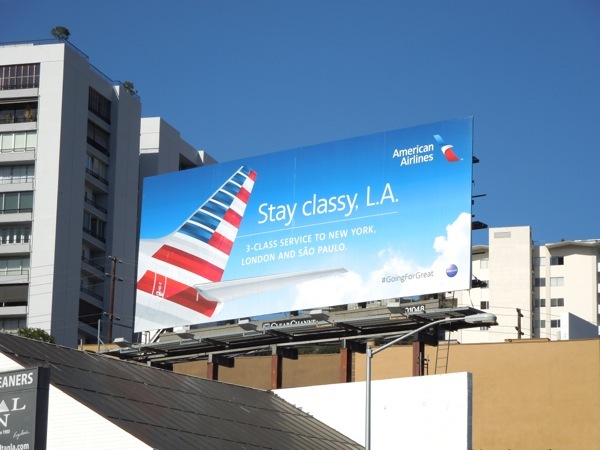 Schwimmer is a recently widowed father with a drinking problem and a son to raise, whilst Sturgess is a brilliant chef, but he just got out of jail for arson and has a nasty coke habit and huge debts. 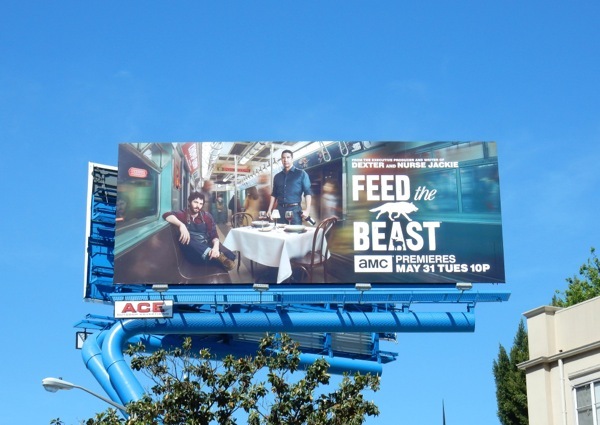 Together they take on the problems of running a New York eatery, navigating the world of petty criminals, corrupt cops and psycho gangsters. 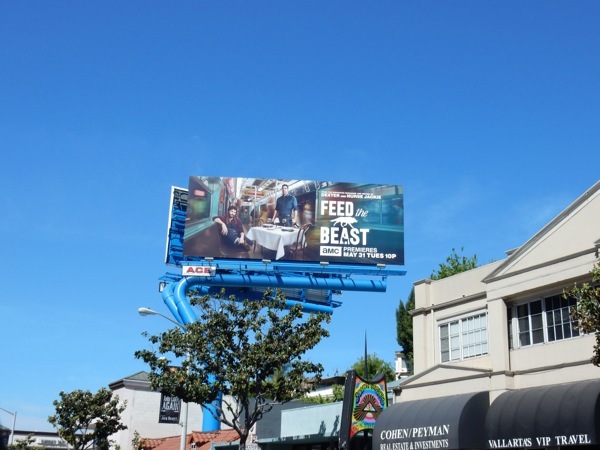 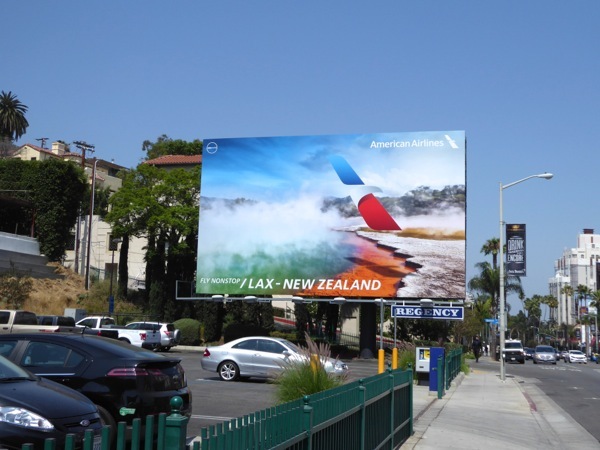 These series launch billboards for Feed the Beast were snapped in the crowded skies of West Hollyood's Sunset Strip and along Robertson Boulevard on May 3, 2016. 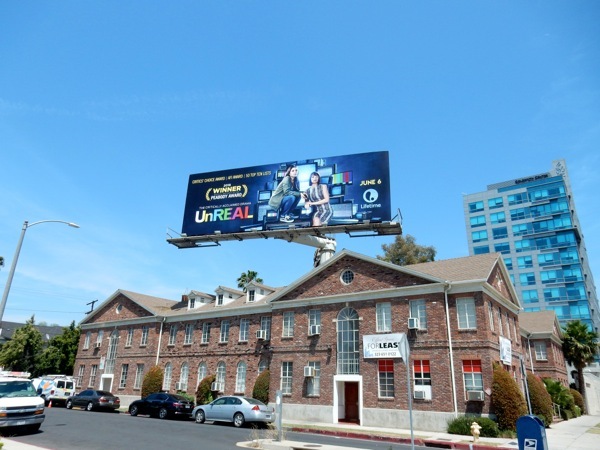 If you're wondering what his other co-stars have done since leaving Friends, be sure to also check out Jennifer Aniston in all these movie and product-endorsement billboards, Matt LeBlanc in these Episodes and Top Gear billboards, Matthew Perry in these Go On sitcom billboards, Courtney Cox in these Cougar Town billboards and Lisa Kudrow in these billboards for The Comeback. 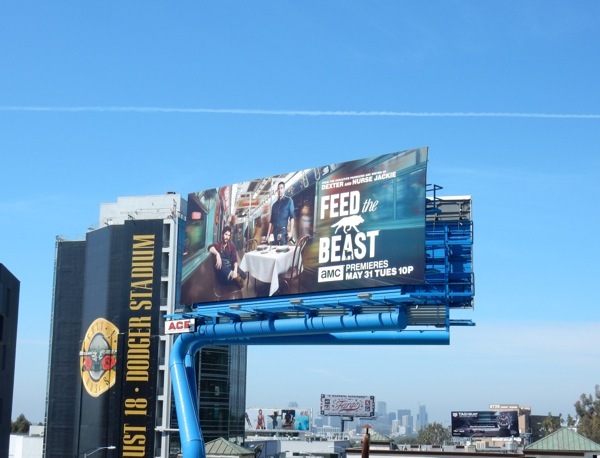 Let's see if Feed the Beast can dish up a series that audiences will savour and make viewers come back for a another bite. 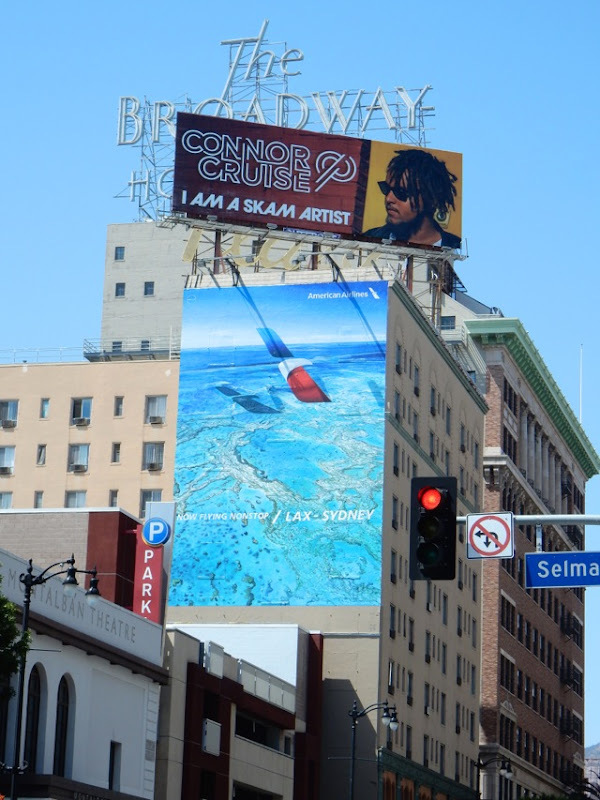 How do you reimagine a groundbreaking television series like Roots, and more importantly, why would you? 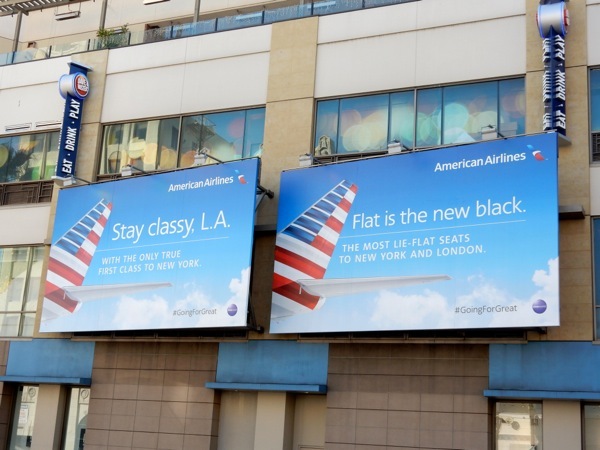 Maybe because things haven't changed that much since the original TV event series in 1977, when Black Lives Matter is a necessary cause, the Oscars white-washing seems to repeat itself every other year and black people continue to be killed by police on a regular basis in America. 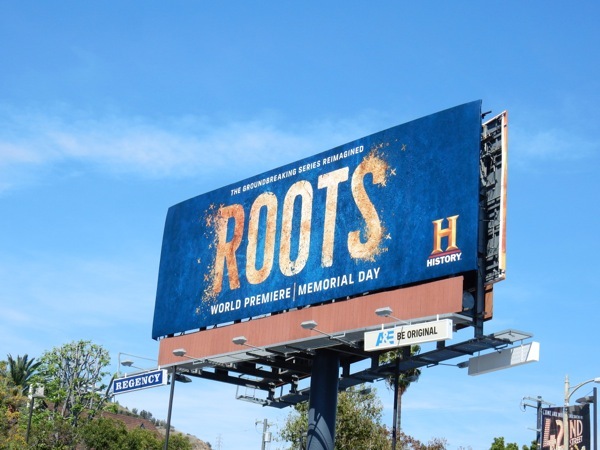 Once again based on Alex Haley's 1976 book, Roots: The Saga of an American Family, the new four-part, eight hour series revisits an important and troubling time in American history, and follows the multigenerational journey of an 18th century African slave sold to the U.S., his life experiences and those of and his descendants. 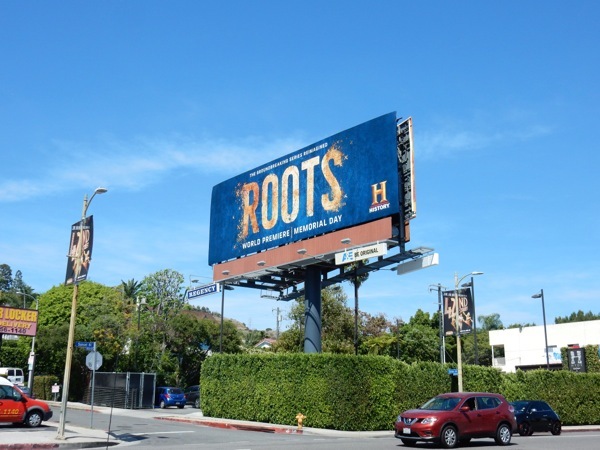 This billboard for History's Roots mini-series remake was snapped along Sunset Boulevard in West Hollywood on April 20, 2016. 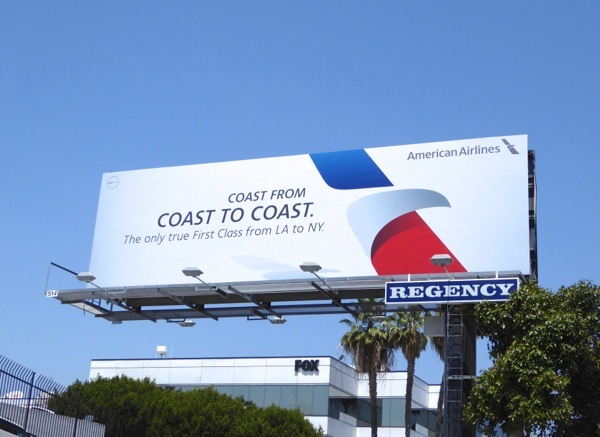 The original series is such a part of American TV history, watched by an estimated 130 million people, so let's see if history can repeat itself this Memorial Day. 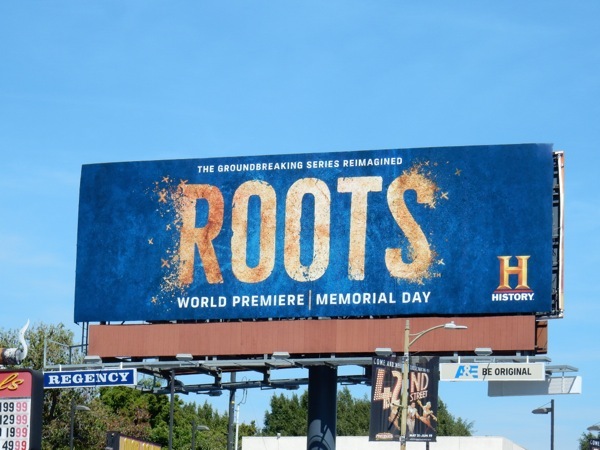 UPDATED: The Roots remake may not have achieved anywhere close to the original viewing figures, but 5.3 million is quite a respectable audience in this day and age. 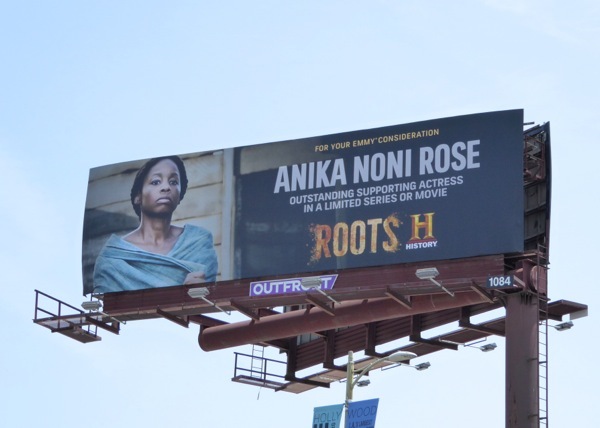 It wasn't long before this Emmy consideration billboard for actress Anika Noni Rose popped up along Hollywood's Vine Street on June 1, 2016. 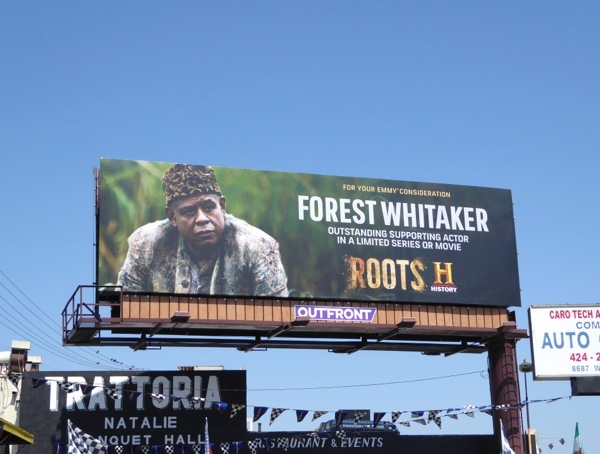 And here's another Emmy consideration billboard for Roots, this one for Oscar-winner Forest Whittaker, snapped along Pico Boulevard on June 2, 2016. 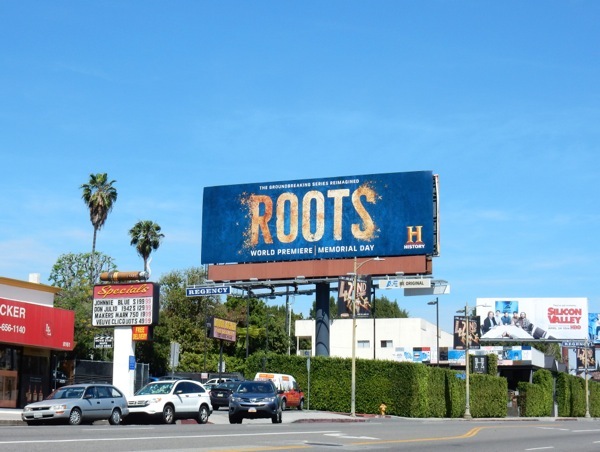 UPDATED: Congratulations to Roots for garnering five Primetime Emmy nominations. 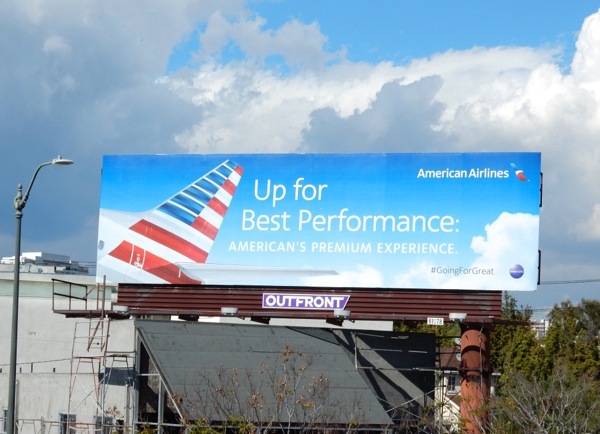 Here's a billboard hoping to turn those nominations into wins snapped at the bottom of L.A.'s Barham Boulevard on September 3, 2016. 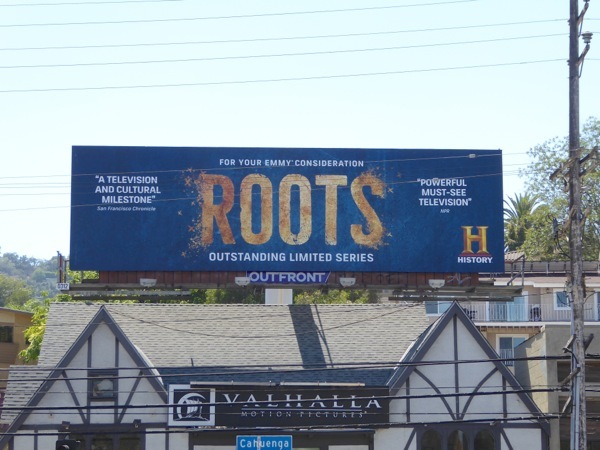 Fans of the mini-series can also enjoy these costumes from the Roots remake on display. 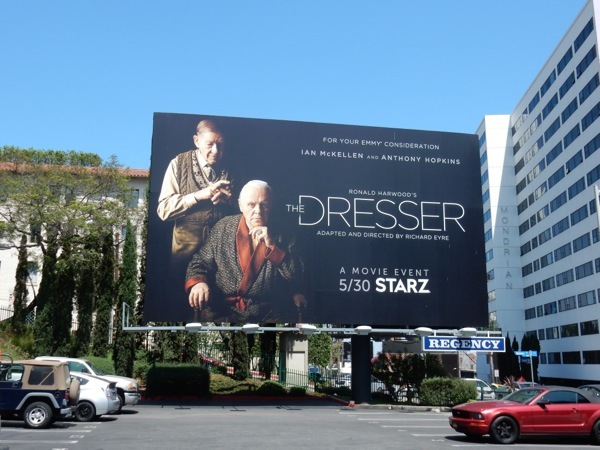 Movie remakes are a pet peeve of Daily Billboard, but how can you argue at a movie event that pairs two acting greats like Ian McKellen and Anthony Hopkins. 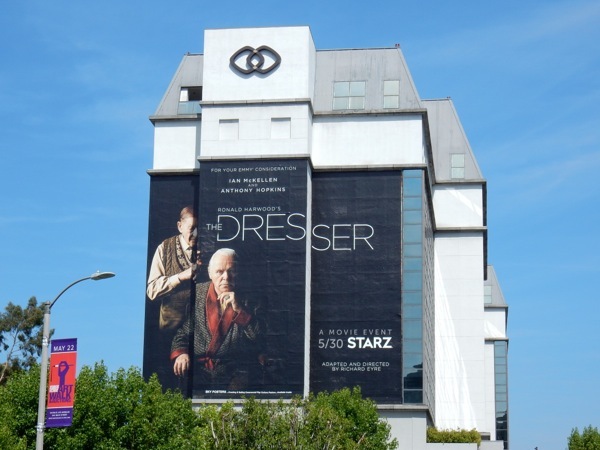 Richard Eyre adapts Ronald Harwood's play for Starz premium channel small screen (which was previously filmed in 1983, earning Oscar nominations for Albert Finney and Tom Courtenay), and sees Hopkins play an aging Shakespearean thespian struggling with the role of King Lear, and McKellen as his backstage manservant. 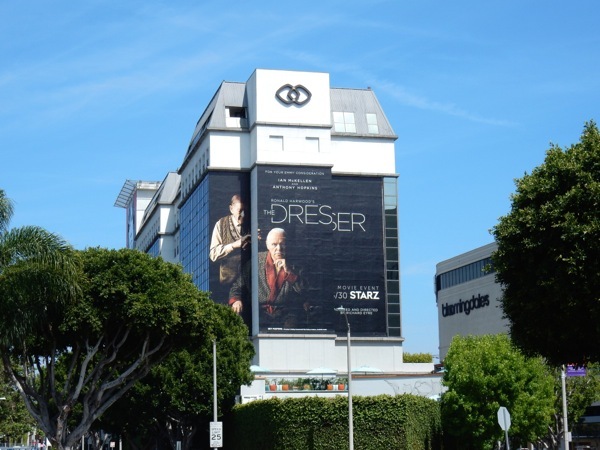 The large landscape billboard for The Dresser was first snapped along the Sunset Strip in West Hollywood on May 10, 2016, whilst the giant-sized version was photographed on the side of the Sofitel Hotel along Beverly Boulevard the next day. 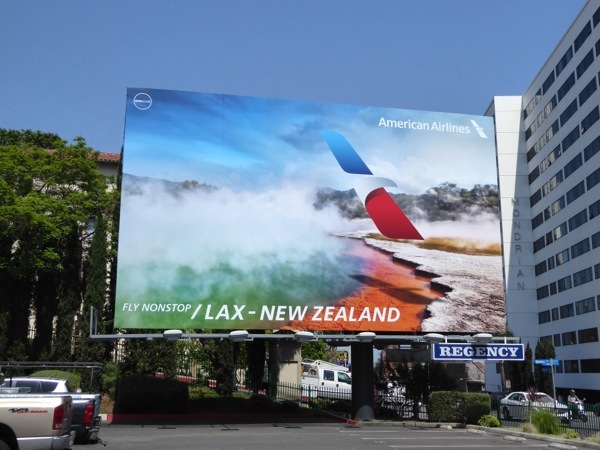 If you're a fan of Anthony Hopkins you can also check the actor out in this billboard for The Rite movie and this Thor movie billboard, meanwhile admirers of Ian McKellen can see him in these X-Men: Days of Future Past movie billboards and these fantastical billboards for The Hobbit movie trilogy. 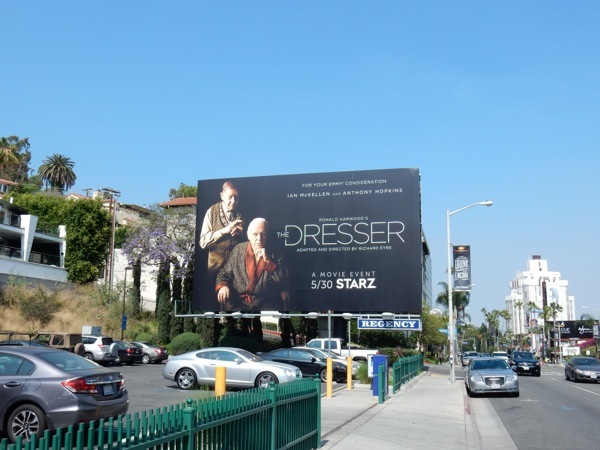 Is The Dresser on your must-see list this Memorial Day? 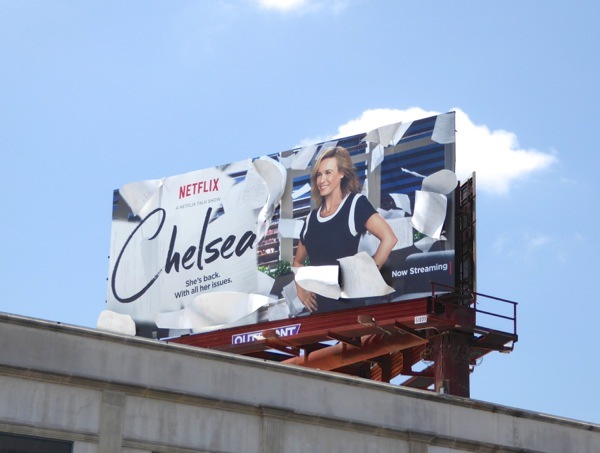 Chelsea Handler (and her dog Chunk) is back on TV with her new Netflix talk show and back in the skies of L.A. with these 3D embellished billboards to help launch the series. 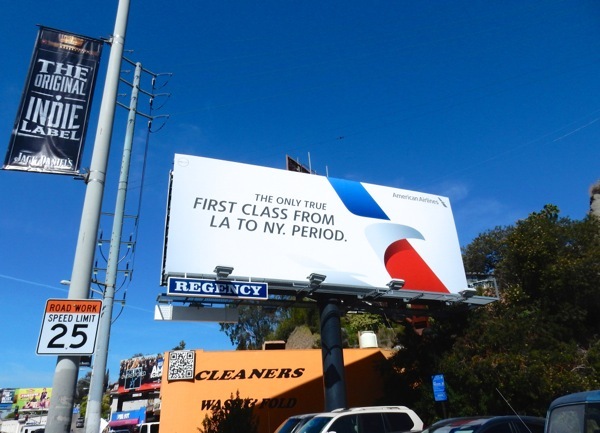 The add-ons take the form of flying sheets of paper that we are meant to believe that the late-night talk show host has thrown up in the air in a diva-like way. 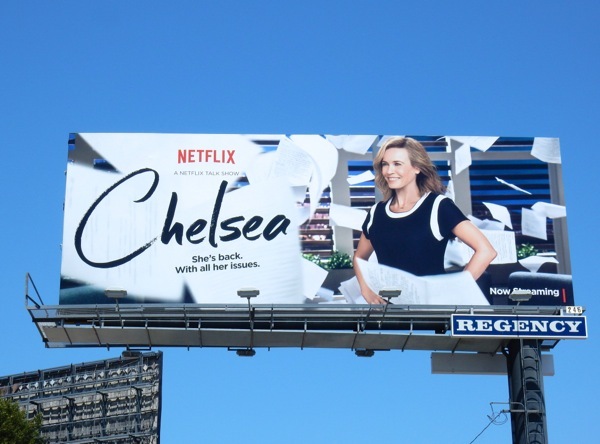 Her new Netflix show is unconventional as it doesn't air every night, but drops three times a week, Wednesdays to Fridays, after midnight on the subscription streaming service. 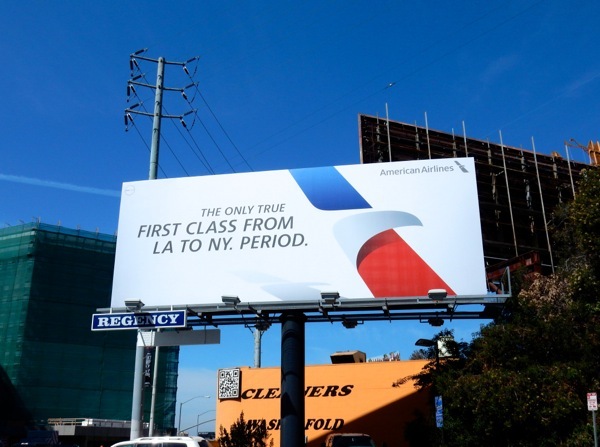 Plus it doesn't always stick to a traditional format every installment, so don't just expect a repeat of her old E! 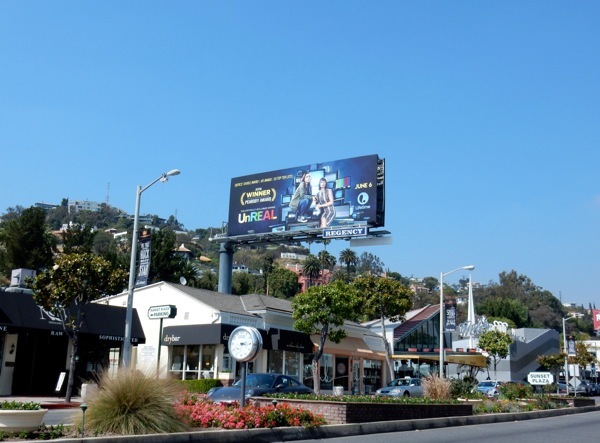 network series, Chelsea Lately. 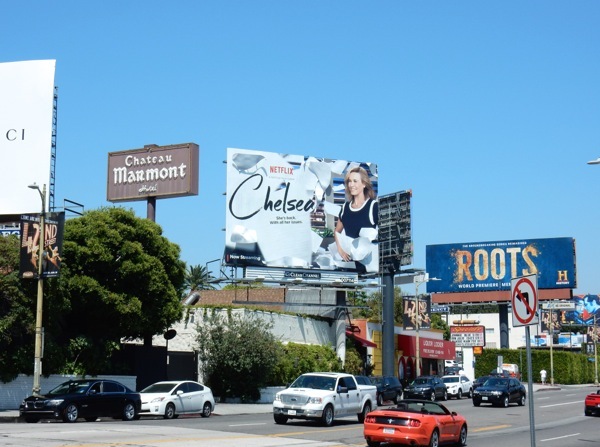 The special 3D billboard for Chelsea's new show was first snapped along West Hollywood's Sunset Strip on May 12, then later high above Beverly Boulevard on May 26, 2016, whilst the standard version was snapped further west along Sunset Boulevard the same day. 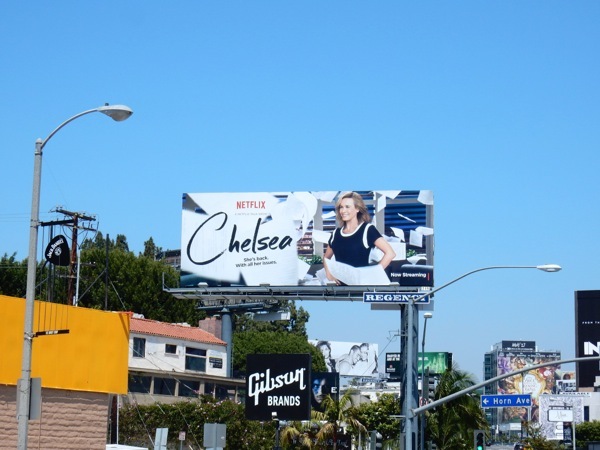 If you're a fan of the unapologetic and frequently naked funny lady, make sure you also check out these Chelsea Does documentary series billboards from earlier this year and this fun billboard parody of The Lion King for her Uganda Be Kidding Me Live standup comedy special. 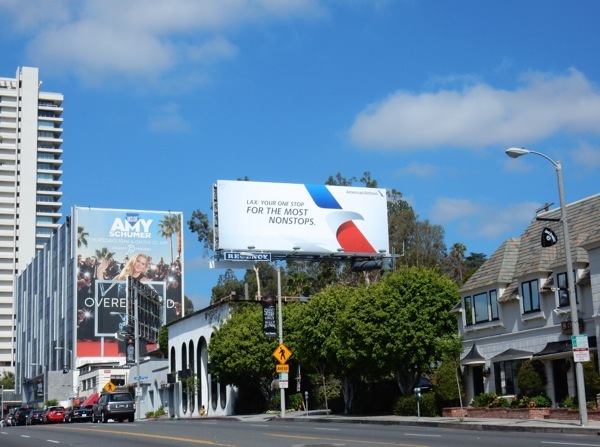 Netflix has ordered 90 episodes a year, but only time will tell whether the streaming platform's binge-watching audience will take to the new three-times-a-week format, and how and when they'll watch the episodes. 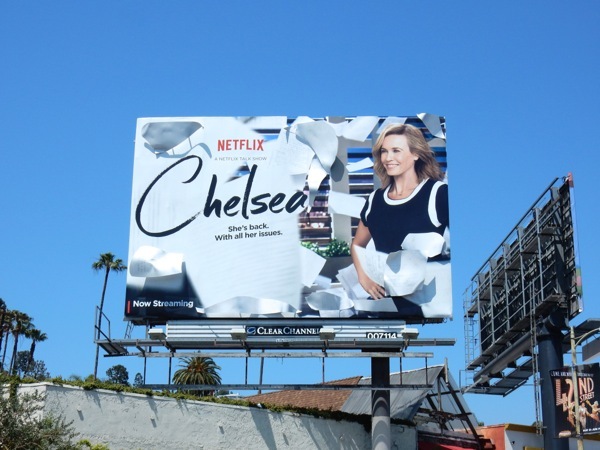 One thing's for sure, Chelsea Handler probably doesn't care what people think, as she's already laughing all the way to the bank with her lucrative new contract. 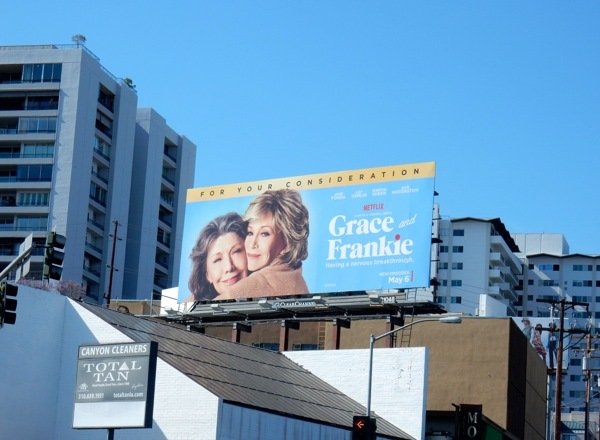 Okay, for the sake of everyone who watched the first season of Grace and Frankie Daily Billboard will address the elephant in the room, it should have been better. 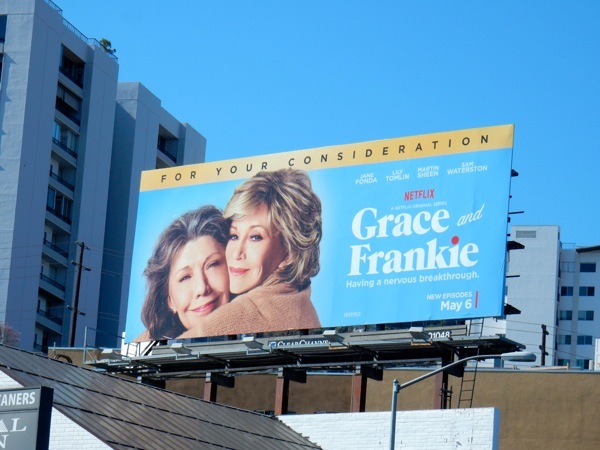 You have two stellar leading ladies here, the Academy Award-winning Jane Fonda and Oscar and Golden Globe nominee Lily Tomlin, but the material in the inaugural season didn't match their talents. 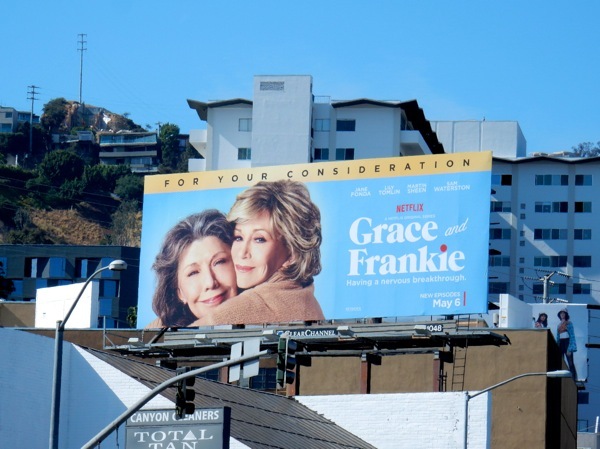 In the Netflix sitcom the pair play the wives of two men who have been having an affair for years and decide to leave them to get married and the resulting fallout which throws the two frenemies together is watchable and entertaining, but it's hardly comedy gold. 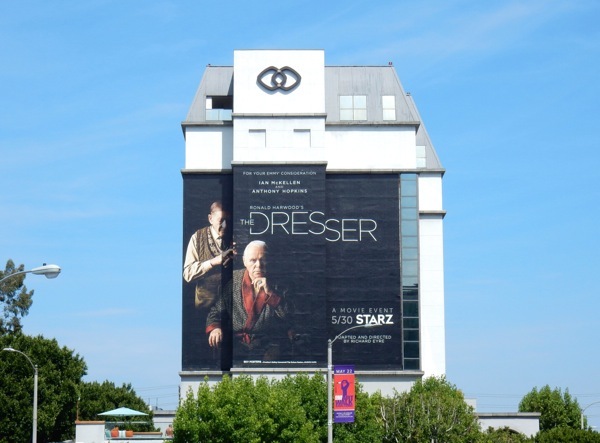 Let's hope this second season delves into their odd-couple friendship and their respective family dramas in more laugh-out-loud comedic ways. 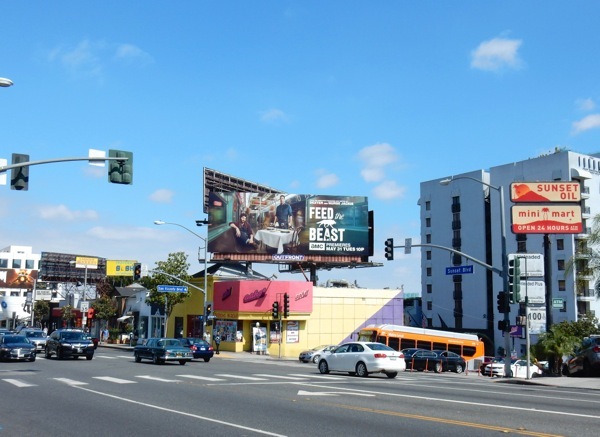 This sophomore season billboard for the Netflix sitcom was photographed above Santa Monica Boulevard and La Cienega Boulevard in West Hollywood on May 4, 2016. 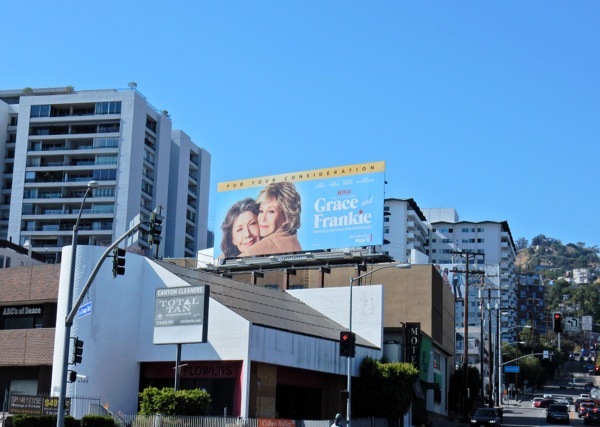 If you're a fan of the show, be sure to also check out these Grace and Frankie season one and Emmy consideration billboards. 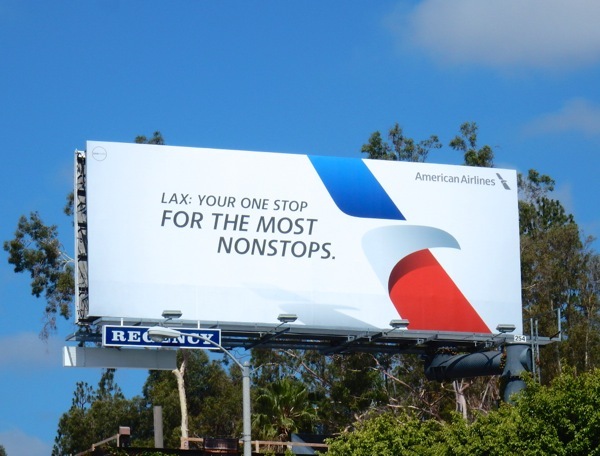 Hopefully this second season will live up to, and even exceed, expectations of what these lovely ladies are capable of. 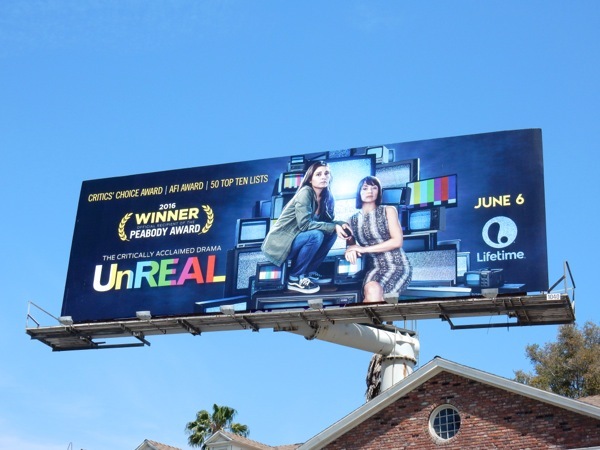 Lifetime's award-winning series UnREAL returns for its sophomore season this Summer for another glimpse behind-the-scenes of what it takes to air a reality dating show like The Bachelor and The Bachelorette (or Everlasting as it's called on this drama). 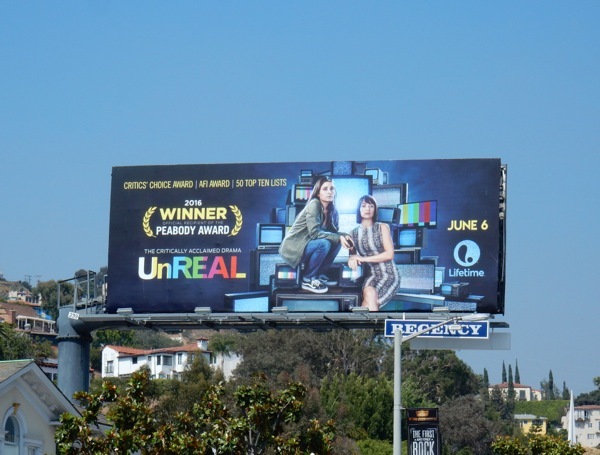 Constance Zimmer won the Critics' Choice TV Award for Best Supporting Actress in a Drama Series for her role as unscrupulous executive producer 'Quinn King' who pushes Shiri Appleby's 'Rachel Goldberg' to manipulate cast and crew to produce the best reality show situations and drama on TV. 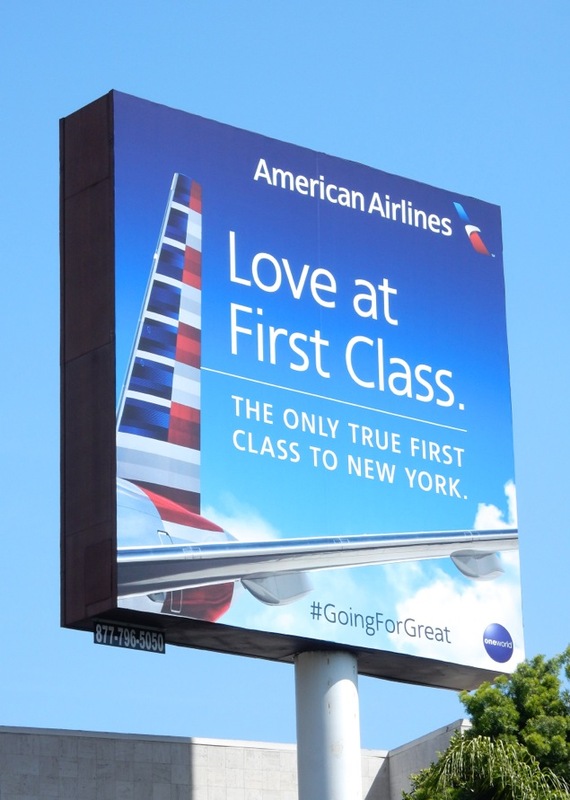 This season as well as the contestants looking for love, there's new romances in store for both leading ladies and no doubt more scandalous distortions of the truth to be had. 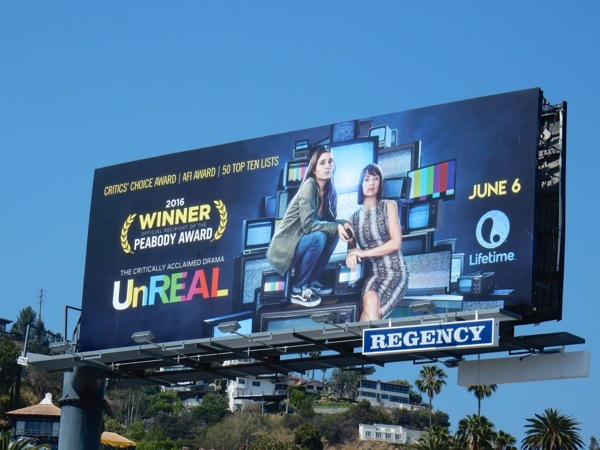 These season two billboards for UnREAL were first spied above West Hollywood's Sunset Plaza on May 10, 2016, plus later along San Vicente Boulevard the next day. 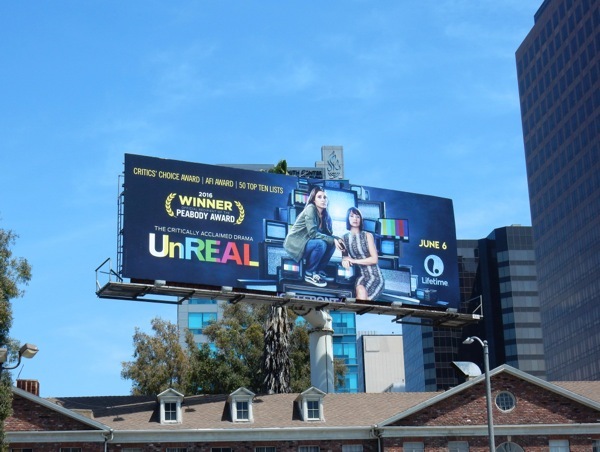 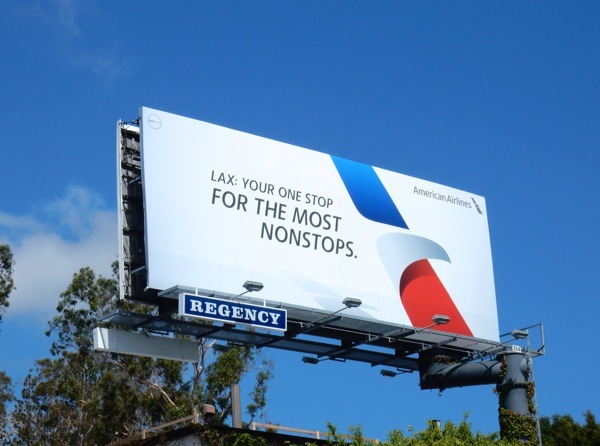 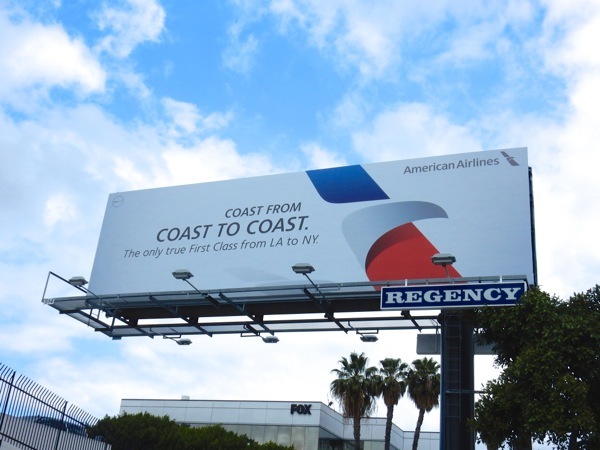 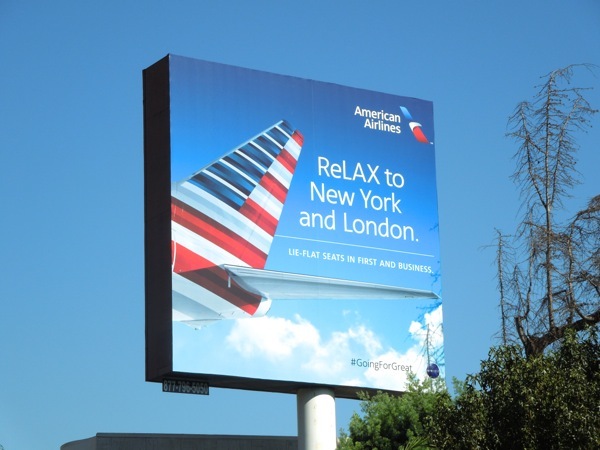 If you're a fan of the series, make sure you also check out these UnREAL season one billboards from the skies of L.A. last May. 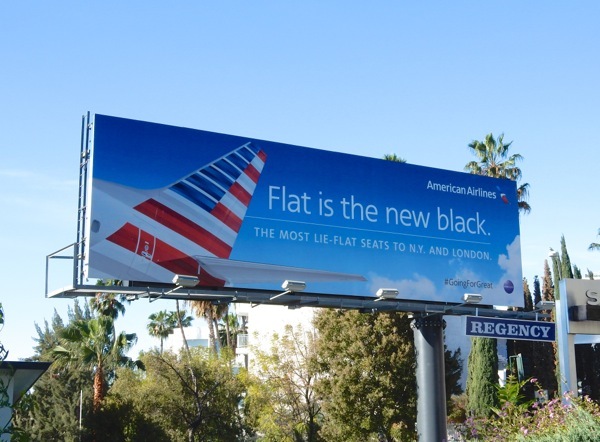 What is real these days anyway, and if it's shown on television surely it must be true, right? 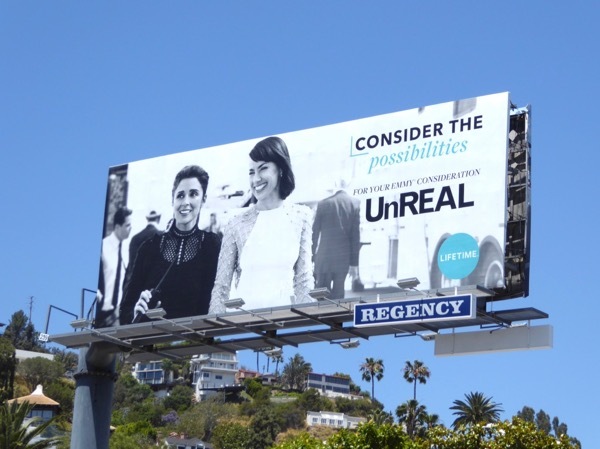 Will you be making a date with UnReal for another ten episodes this Summer? 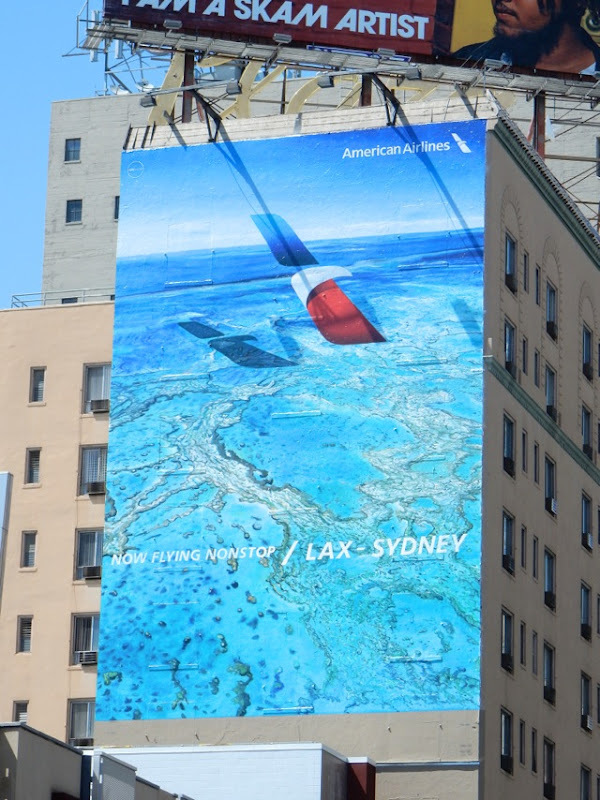 UPDATED: Here's also a portrait version of this second season ad creative, spied along Hollywood Boulevard on a gloomier June 6, 2016. 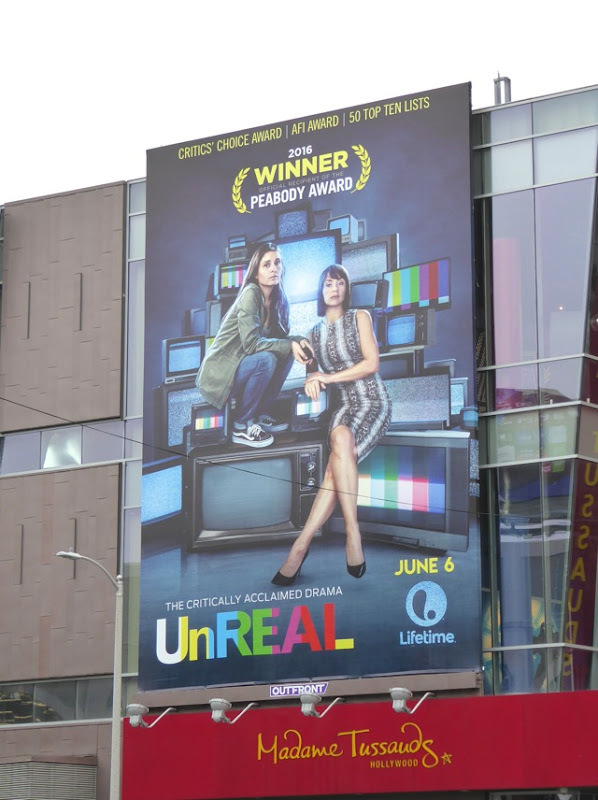 UPDATED: Here's also the Emmy consideration billboard for the sophomore season of UnREAL snapped above West Hollywood's Sunset Strip on June 12, 2017.